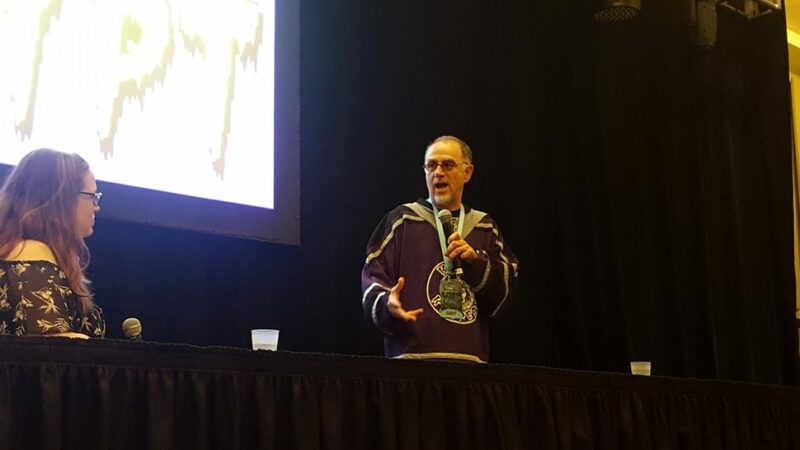 John Kassir Dazzles Fans with Tales from Street Performing to Crypt Keeping at ComiCONN Panel - Horror News Network - The Horror News You Need! 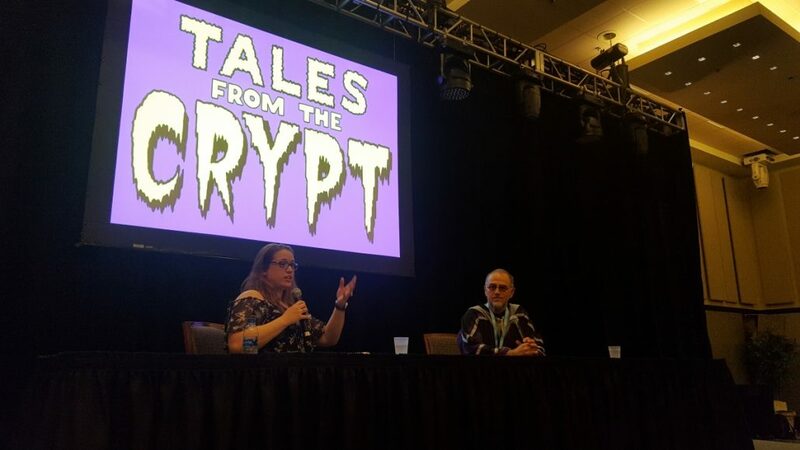 John Kassir- the unforgettable voice actor behind the infamous Crypt Keeper of HBO’s classic anthology series, Tales from the Crypt– kicked off this weekend’s ComiCONN at Foxwoods Resort Casino with an engaging panel about his storied career. Veteran Altered Reality Entertainment panel interviewer/host Lisa asked Kassir about the various highlights of his career, and fans were given the opportunity to ask several questions of their own. 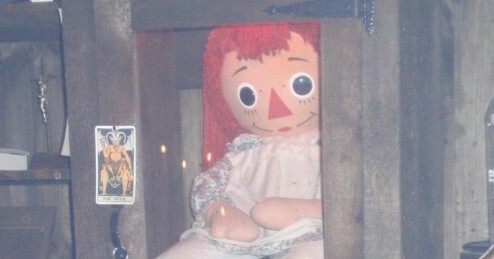 Horror News Network covered the event to bring you all of the gory details! 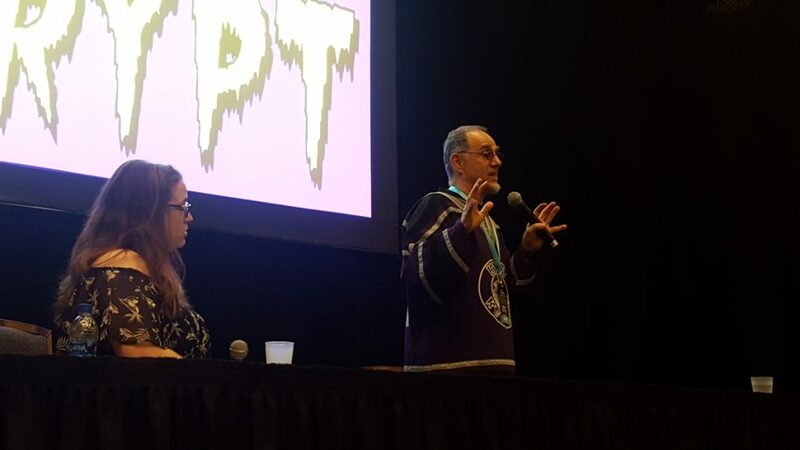 Anyone who has ever met John Kassir will tell you that the man is just as passionate about the amazing Crypt Keeper as any die-hard Tales from the Crypt fan out there. 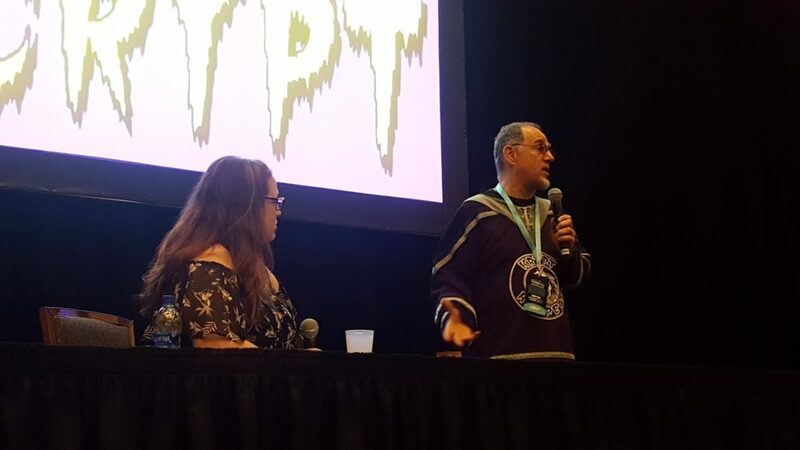 That degree of love translated into a lively and humorous panel, filled with numerous distinct voice performances and an appearance by Kassir’s signature Crypt Keeper mask on a popsicle stick. He didn’t stay seated for long, and he soon jumped into everything from a two and a half minute recreation of several classic bits from The Wizard of Oz to his detailed reasoning behind the various sounds of Meeko, the raccoon from Disney’s Pocahontas. What follows is a recap of the important moments in Kassir’s life and career. By the time high school came around, Kassir said his friends and he began entertaining their classmates by reading the morning announcements in the distinct voices four members of The Beatles. By the time he entered college, he began tho think seriously about performing for a living. In fact, he joined a mime troupe in college. As he said it, “mimes were very popular at the time. This was before a bunch of bad mimes came along and gave it a bad name.” He told the audience that he moved to New York City right after college, was casted in an Off-Broadway show, and “survived by street performing outside of the Metropolitan Museum of Art.” His street performances consisted of everything from miming, improvisational responses to tourists and bystanders, and his spot-on Wizard of Oz routine. Soon, Kassir was moving up from the world of street performing, and he began a career trajectory which would kick off his relationship with HBO. He was approached about competing in a pre-American Idol sensation called Star Search, where he perfected a stand-up routine that beat out fellow comics such as Rosie O’Donnell and Sinbad before either of them were famous themselves. His routine centered around a character who was addicted to television, and his voice and personality would constantly change to mimic the changing of the different TV channels. He ultimately won the grand prize of $100,000 and an opening gig for Tom Jones in Las Vegas. Later, Kassir scored a recurring role on First and Ten, HBO’s first original series. 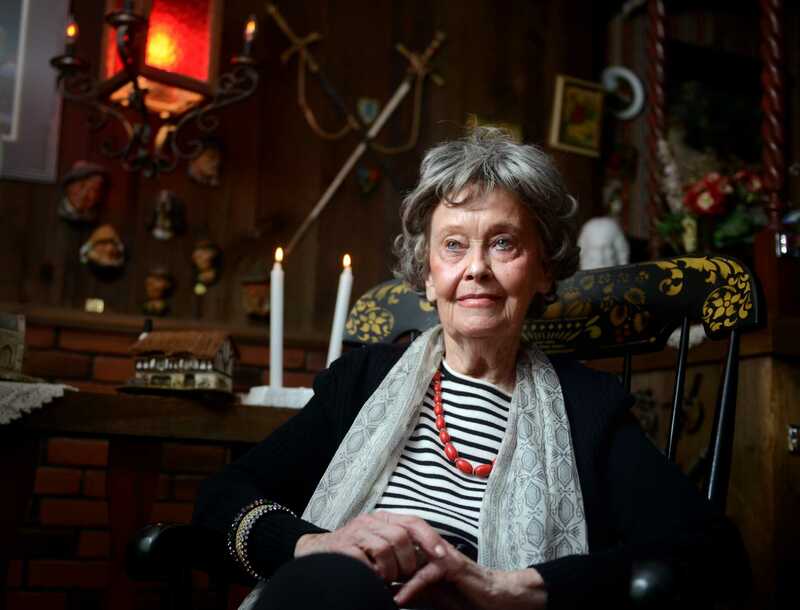 The way he told it, he had a good relationship with the studio and, “they knew I did all of these voices and characters.” He was asked to interview for the role of the Crypt Keeper he grew up with in all of his favorite horror comics! 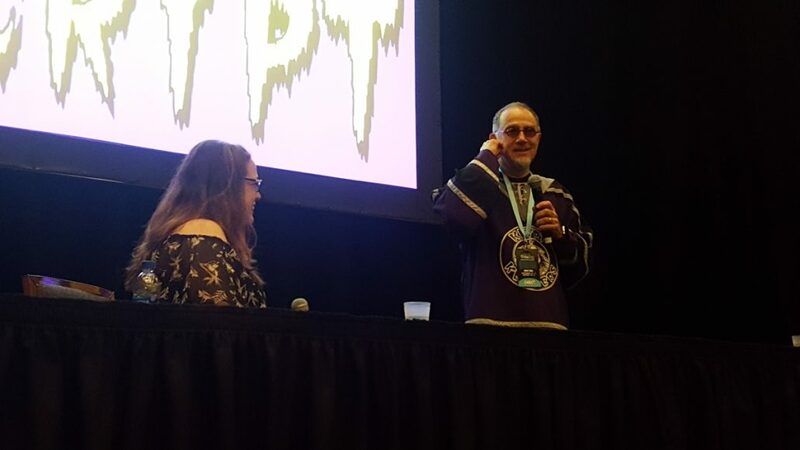 Kassir said his first audition was with Kevin Yeager, the legendary make-up artist behind Freddy Krueger, Chucky, and the Crypt Keeper himself. He was given one line to read in a voice of his own creation: “Be careful what you ax for… you just might get it!” Even though he was thinking, “Who wrote this crap?,” he channeled a mix of Margaret Hamilton’s Wicked Witch of the West cackle mixed with a slimy texture to compensate for the various holes and crevices in the Crypt Keeper’s throat. Yeager loved it, and Kassir was off to meet with Joel Silver, Richard Donner, and Robert Zemeckis… three of the biggest film producers of all time! They also were thrilled with Kassir’s vocal vision for the Crypt Keeper, and he was off to production in 1988 for initial air dates in 1989. Special effects aren’t the only thing that’s changed in the industry since Kassir lent his distinct voice to the Crypt Keeper. He’s just as busy today, with roles such as Elliot in 2016’s Pete’s Dragon, one of the heads of the two-headed giant in Jack the Giant Slayer, and various characters and animals for Illumination, the group behind Minions and The Secret Life of Pets. However, the audition and recording process is very different. 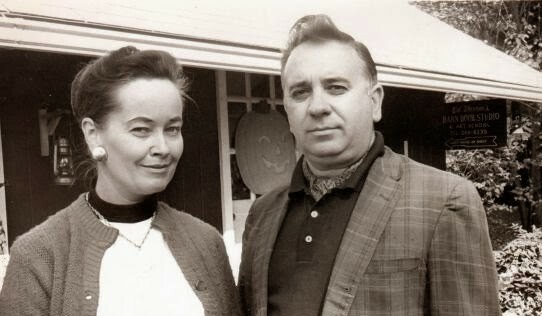 Whereas all of his early auditions occurred in person in front of the creative forces behind a production, now he usually auditions from home by submitting recordings based on some notes and pictures. While the process takes less time, Kassir said it’s “a double-edged sword” because there’s no opportunity to get notes from the director to try different approaches. Kassir ended by telling fans that he believes his career in voice acting allowed him to perform much later into his career than conventional acting would allow. He said he can audition for all sorts of roles, and his age doesn’t ever factor into whether he can voice a character. Here’s hoping that a Tales from the Crypt reboot will eventually materialize and he will have another chance to perform as the Crypt Keeper before he retires! 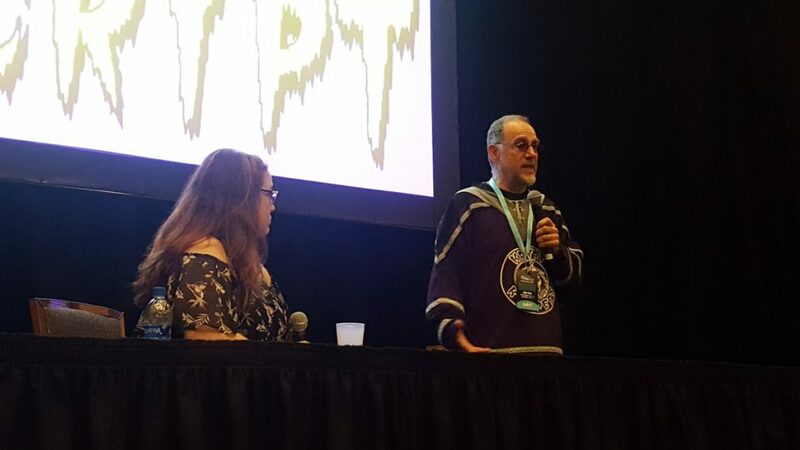 The ComiCONN Tales from the Crypt panel was a special blend of comedy and history as Kassir told all of his stories with a special touch of sight and sound. Hopefully, you learned as much from our recap as we did by enjoying the event in person! Stay tuned to Horror News Network for future coverage of ComiCONN at Foxwoods Resort Casino, the upcoming works of John Kassir, and Tales from the Crypt reboot news as soon as it breaks!